Creating a delicious centerpiece for the holiday festivities should not be a monumental task that takes away time spent with friends and family. “Great food is simple to prepare,” says cookbook author and New York Times “The Minimalist” columnist Mark Bittman. If using fresh allspice berries, nutmeg pieces, peppercorns and thyme, blend in spice or coffee grinder then add the rest of ingredients. Otherwise mix all and rub evenly over bird and under skin of breast. Make sure the turkey is thoroughly defrosted before starting. Preheat oven to 350°F. Place bird in large roasting pan on a V-shaped or flat rack. Brush the turkey with tablespoon of butter or olive oil. “The key to a great tasting turkey is to add fat, it will look and taste better,” says Bittman. Before adding rub, lift the breast skin up and rub oil or butter directly on meat, then rub entire bird with your fat of choice. Repeat process with Bittman’s rub. Pour in one cup of stock or water in roasting pan. Cover the turkey loosely with aluminum foil (remove foil after about one hour of roasting time remains). Roast, basting with additional butter or oil every 30 minutes and add stock or water as needed to keep bird moist. When there is one hour of cooking time to go (internal temperature of turkey will be about 125ºF), remove foil and turn oven heat up to 400 ºF for the remaining cooking time. When the bird is done—an instant-read thermometer should read at least 165 ºF when inserted in mid-thigh. Remove the bird to a platter and let it rest for 15 minutes before carving. Step 1: Be sure to use a good, sharp knife. Sharp knives are not only safer, they will help you smoothly cut thin, even slices without shredding the meat. Step 2: After the turkey is cooked (meat thermometer should read 165-180oF when inserted in the thickest part of the turkey) cool the bird for 15 minutes. Cooling makes the meat firmer and easier to slice. Remove and set aside the turkey legs and the last joint of each wing. Make a long, deep (to the bone) horizontal “base cut” into the breast just above the wing. Step 3: Slice down vertically through the breast until you meet the original base cut. This will release perfect, even slices. Now you’re ready to serve your delicious and properly carved turkey. Happy holidays and feasting! Based on the most requested and top ranked recipes by home cooks, McCormick has identified the five most cherished holiday recipes. tablespoons of the butter. Cover with foil. Bake 30 minutes. coarse crumbs form. Stir in pecans. Remove sweet potatoes from oven and stir gently. Sprinkle evenly with pecan topping. powder, baking soda and salt; set aside. overbeat. Pour batter into prepared pans. minutes. Remove from pans; cool completely on wire rack. 2. Shape into 1-inch balls. Place 1 inch apart on ungreased baking sheets. cups sugar. 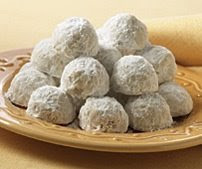 Place sugared cookies on wire racks to cool. When cool, roll again in sugar. spray. Mix flour, ginger, cinnamon, baking soda and salt; set aside. 2. Beat butter and 3/4 cup of the sugar in large bowl with electric mixer until light and fluffy. and water just until blended. Spread evenly in prepared pan. knife or spatula, swirl icing through batter to marbleize. 4. Bake 30 minutes or until toothpick inserted in center comes out clean. Cool in pan 15 minutes. refrigerated icing over bars. Cut into bars. Store in refrigerator. They represent America’s love of classic holiday dishes that have a modern flavor twist. 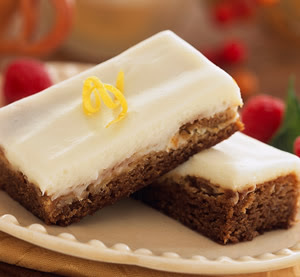 These recipes and many more are part of the holiday highlights available at the newly redesigned http://www.mccormick.com/. From the Thanksgiving family feast to cookie exchange parties, holiday cooks can feel good about serving flavorful favorites from the McCormick kitchens. 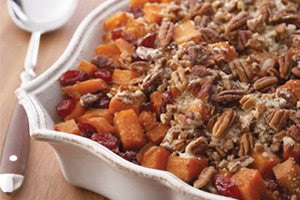 For a variation on the typical sweet potato side dish, try Roasted Sweet Potatoes with Cinnamon Pecan Crunch, which has an added touch of ginger. 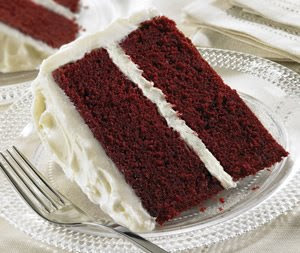 Red Velvet Cake with Vanilla Cream Frosting makes a beautiful centerpiece for any holiday dessert table. None of the candidates channeled Herbert Hoover's "a car in every garage and two chickens in every pot" slogan, but we've decided to call out all the stops in these uncertain economic times. The sages of American literature and popular journalism, The Old Farmer's Almanac, have tossed along their take on chicken with gusto. The recipe for this delectable dish is featured below and in The Old Farmer's Almanac Everyday Cookbook, along with 400 other mouthwatering recipes. For salsa: Halve the peppers and remove the stems, seeds, and large ribs. Set aside half of each color. Dice the remaining pepper halves and place them in a nonreactive bowl with the remaining salsa ingredients. Stir well. Allow the salsa to meld at room temperature for at least 1 hour before serving. Taste and adjust seasonings, as desired. Cut the remaining pepper halves into julienne strips and small star shapes for garnish; dice the trimmings and add to the salsa. For chicken: Rinse the chicken and pat it dry. Place the chicken breasts in a large resealable plastic bag. Whisk together the remaining ingredients in a small bowl to make a marinade and pour it over the chicken. Seal the bag and refrigerate it for several hours or overnight, turning occasionally. Preheat the grill. Remove the chicken from the marinade and pour the marinade into a small bowl. Coat the grill rack with vegetable cooking spray and place it 4 to 6 inches from medium-hot coals or flame. 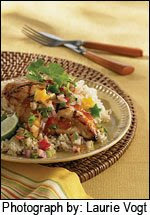 Arrange the chicken on the grill and cook for 6 to 8 minutes per side, basting with the marinade and turning occasionally. The chicken is cooked through when the juices are no longer pink and the internal temperature reads 180 degrees F on a meat thermometer. Place a dollop of salsa on each serving plate and put a chicken beast half in the center. Garnish with the pepper stars and stripes. Makes 6 servings. One of the most innovative sources for recipes continues to be the California Table Grape Commission. Several years ago, they sent a recipe that combined grapes and salmon .... Oy, it is to weep for such lush perfection. Three recipes with authentic culinary pedigrees featuring grapes can make fall and holiday entertaining fun and easy. One is a terrific aperitif for a cocktail party, an intimate dinner or a gathering of the book club. Two is an easy entrée with a delicate treatment of sole. Three is a James Beard original. One: California Grape Cocktail – Taste is what matters in the 21st century revival of the cocktail and the cocktail party. Many modern mixologists use fresh juices of all kinds to create multi-layered drinks that can rival any Jazz-age 20th century predecessors. In this sugar-rimmed aperitif, that cocktail workhorse vodka infuses the fresh grape and lemon juice base with a measure of zip, while the champagne top-off gives the drink a bubbly finish. Two: Sole Véronique – Here's an entrée to send cooks back to their food history books with pleasure. 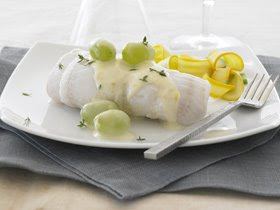 None other than the famous chef Auguste Escoffier created this time-honored soul-mating of poached sole and green grapes in a classic velouté sauce. It's a simple preparation that still has the power to "wow." Three: Grapes with Brown Sugar and Sour Cream – The legacy of the famed James Beard is featured in this simple dessert. One of his favorites, Beard often served this lovely finale when other more complicated dishes preceded. These recipes showcase the trend towards reviving the elegant and sophisticated menus of the past, while still maintaining our insistence on the best, freshest ingredients. That grapes – a fruit always associated with sumptuous dining -- are components in each one should be no surprise. Blend all but one grape with the lemon juice. Strain through a fine-mesh sieve. Measure 2 parts juice to 1 part vodka into a small pitcher or measuring cup. Divide the juice and vodka mixture evenly between the glasses and top off with a splash of champagne. Serve immediately. Optional Sugar-Rimmed Glass: Spread the sugar onto a small plate. 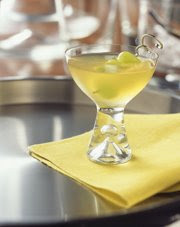 Slice the reserved grape in half and use it to moisten the rims of two martini glasses. Dip the rims in the sugar and shake off any excess. Fill glass with drink mixture and enjoy. Melt the butter in a large skillet or sauté pan. Stir in the sugar, orange juice, orange zest, and sliced grapes. Cook on medium-high until bubbly. Reduce the heat to low. 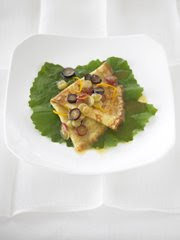 Working quickly, place a crepe into the sauce and fold into a fan shape. Lift the crepe from the pan and arrange on a warm serving dish or platter. Repeat with the remaining crepes. Increase the heat to medium-high and add the Cointreau, being careful to avoid lighting the liquor on fire unless that is a desired effect. Stir to blend and spoon the warm grape sauce over the prepared crepes. Serve immediately. In medium bowl, combine the flour, sugar, and salt. Make a well in the middle of the dry ingredients and add the eggs, yolk, milk, and brandy. Gradually blend the dry ingredients into the wet ingredients until the mixture is smooth and lump-free. Let the batter rest for at least 30 minutes. When you are ready to cook the crepes, the batter will have thickened slightly from resting. Add water to the batter 1 tablespoon at a time until it has thinned to the consistency of heavy whipping cream. Heat a nonstick skillet or sauté pan over medium-high heat. Brush lightly with the oil and swirl in a scant ¼ cup of the crepe batter to coat the bottom of the pan. Cook for 1 minute, or until the very edges of the crepe are lightly brown. Flip with a flexible spatula and brown the other side. Repeat with the remaining batter. Use crepes immediately or cover and keep chilled for up to 24 hours. Makes 8 to 10 crepes. Nutritional analysis per serving (without optional liqueur): Calories 483; Protein 9.7 g; Carbohydrate 63 g; Fat 21 g; 39% Calories from Fat; Cholesterol 199 mg; Sodium 139 mg; Potassium 301 mg; Fiber 1.4 g.
Preheat oven to 325 degrees F. Lightly butter a glass or ceramic ovenproof baking dish. Fold the fillets in half, skin side in. Place the fillets in the prepared dish with the wine, onion, lemon slices, thyme, and peppercorns. Cover the dish loosely with foil and bake for 10 to 12 minutes for small fillets and 16 to 18 minutes larger fillets, or until the fish is just cooked through. Carefully lift the fish from the pan and place on a warm serving dish. Strain any cooking liquids and reserve. Discard the solids. To make the sauce, melt the butter in a medium saucepan over medium heat. Whisk in flour and cook until the roux is bubbly and golden brown. Remove the pan from the heat and pour in the strained cooking liquids. Stir well. Return the pan to the heat, add the half-and-half, and simmer the sauce for 3 minutes, stirring constantly. Season with the salt and white pepper. Add the grapes and lemon zest. Spoon sauce over the sole and serve immediately. Nutritional analysis per serving: Calories 188; Protein 22.5 g; Carbohydrate 7 g; Fat 5.5 g; 27% Calories from Fat; Cholesterol 70 mg; Sodium 298 mg; Potassium 516 mg; Fiber .5 g.
Divide and arrange 3/4 cup of halved grapes in each of six dessert dishes. Sprinkle each with brown sugar and top with 1/3 cup sour cream. Chill until ready to serve. Note: A slightly fancier version of this is sometimes called Grapes Romanov. 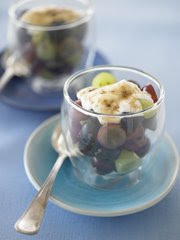 Arrange halved grapes in individual heatproof serving dishes, but top first with sour cream and then brown sugar. Chill for at least 1 hour so that the brown sugar melts into the sour cream, then caramelize or “brûlée” the sugar with a small torch or by placing the dishes under a preheated broiler until the sugar is bubbly, about 2 minutes. Serve immediately. Nutritional analysis per serving: Calories 301; Protein 3 g; Carbohydrate 38 g; Fat 17 g; 48% Calories from Fat; Cholesterol 34 mg; Sodium 49 mg; Potassium 380 mg; Fiber 1.2 g.
In a large bowl combine the black beans, corn, cilantro, green pepper, onion and tomato. Mix together. Add vegetable oil, vinegar, lime juice, salt and pepper. Mix well so that everything is evenly coated. Refrigerate and let sit for at least 2 hours before serving. For best flavor, let sit over night. Serve with scoop-style tortilla chips. Home cooks, caterers, chefs, dietitians and others are invited to compete for cash in the first-ever Rio Star Grapefruit Recipe Challenge www.riostarchallenge.com sponsored by grapefruit producers from the Rio Grande Valley of Texas. Taste of the South magazine www.tasteofthesouthmagazine.com is the exclusive media partner for the contest. “The goal of the challenge is to increase awareness of a very special variety of grapefruit, the Rio Star, available in supermarkets from mid-October through May. We are challenging inventive cooks in the U.S. and Canada to submit nutritious, delicious and original Rio Star grapefruit recipe creations,” said Eleisha Ensign, executive director of TexaSweet Citrus Marketing, Inc. based in Mission, Texas. Contest entry forms, rules and frequently asked questions may be found online at www.riostarchallenge.com. The contest begins October 15 and ends February 15, 2009. Winners will be notified no later than April 1, 2009. There are three recipe categories in the contest – salad, main course and dessert – and two divisions – home cooks and professionals. Cash prizes of $500 each will be awarded for the best recipe in each category and division. A grand-prize winner from each division will be awarded an additional $1,000. Total prize money of $5,000 is allocated for the contest. Texas grown citrus is recognized worldwide and is extensively distributed in holiday gift baskets and sold in retail outlets during the fall, winter, and early spring each year. Rio Star grapefruit is recognized for its deep red colored flesh and sweet taste. Information about Texas citrus is available at www.texasweet.com or info@texasweet.com. Recipe entry forms and rules may be requested by writing to Texas Rio Star Grapefruit Challenge, 901 Business Park Drive, Ste. 100, Mission, Texas 78572. Please include a self-addressed-stamped envelope. Yes, it seems chicken ideas come in waves (or should that be flocks?) , but here are some that use a cooking method many Americans don't employ as much as the old days, when every kitchen had a cast iron Dutch oven. I speak of the braise. Dark chicken meat like drumsticks, thighs and leg quarters (which are super-cheap compared to the boneless breast craze) braise particularly well, as their extra fat allows for the development of rich flavors. Braising is an easy technique to learn, as it involves simply browning the meat on the top of the stove, and then simmering it over low heat while tightly covered. A small amount of liquid like wine, chicken stock or orange juice is added to the pan to provide the needed moisture. From the National Chicken Council and U.S. Poultry & Egg Association, here are two new braised chicken recipes that make delicious autumn meals. The finished dishes are so succulent that the meats practically melt in the mouth. Serve over rice or pasta or with crusty bread to soak up the flavorful juices. 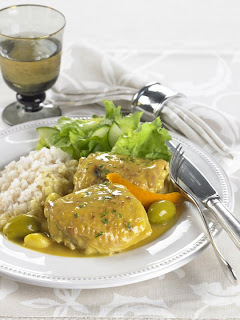 Orange and Green Olive Braised Chicken infuses chicken drumsticks with the flavors of orange juice and tangy green olives. Start by coating the chicken in a flour mixture and browning on top of the stove. When ready to braise in the oven, add strips of orange peel, garlic cloves, chicken stock, orange juice, bay leaves, saffron and sliced olives. Cook, covered, over low heat for about an hour and serve. In gallon size plastic bag with zipper top, combine flour, salt and pepper. Add chicken thighs, seal bag, and toss to completely coat with flour mixture. In large, oven-proof sauté pan, warm olive oil over medium high heat. Remove chicken from bag, shake off excess flour and place in pan, skin side down. Cook chicken over medium high heat until golden brown, turning once, about 5 minutes per side. While chicken is cooking, peel long strips of zest from the orange with vegetable peeler. When chicken is browned, add whole peeled garlic cloves to pan, placing around chicken. Reduce heat to medium and cook one minute. Add orange juice and bring to a boil; cook for 3 minutes. Add chicken stock, again bring to a boil and cook another 3 minutes. Add bay leaves, olives, saffron and orange zest peel to the pan. Cover and place pan in oven. Cook chicken until fork can be easily inserted into chicken, about 50 minutes. Remove chicken from pan and place on serving platter. Place pan back on stove and bring to a boil; boil for 5 minutes more. Remove bay leaves and remaining garlic pieces; spoon sauce over chicken, top with parsley and serve. Chicken Braised with Pumpkin, White Beans and Spinach is a tasty recipe that focuses on some of the favorite foods of fall. Start by cooking bacon strips in the pan to be used to braise the chicken, and then brown the thighs and drumsticks in the remaining drippings. Add garlic, shallots and wine to the pan, and boil. Add chicken stock, pumpkin puree, white beans and sage, and braise in the oven for about 40 minutes. 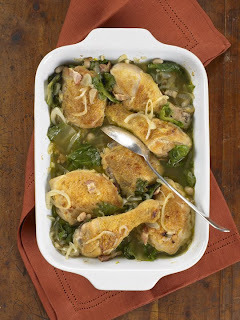 Remove the cooked chicken from the pan, boil the remaining sauce to thicken, add the spinach and serve. Sprinkle chicken with salt and pepper and set aside. In large sauté pan with tight-fitting lid, sauté bacon over medium heat until crisp, about 5 minutes. Remove bacon and drain on paper towels. Crumble and set aside. Add olive oil to pan and warm. Add chicken, skin side down. Cook chicken, turning, until skin is nicely browned, about 4 minutes per side. Add garlic and shallots to pan and sauté for 2 – 3 minutes, until fragrant. Pour wine in pan and bring to a boil, scraping up brown bits on the bottom of the pan. Boil for 2 minutes until wine is slightly reduced. Add chicken stock, pumpkin puree and sage; bring to a boil. Reduce heat to low and simmer 40 minutes. Add beans to pan, cover and simmer an additional 15 minutes. Remove chicken to a plate and reserve. Bring sauce to a boil and cook until reduced and thickened, about 10 minutes. Add spinach to sauce and stir. Return chicken to pot, cover, reduce heat to low and simmer for about 5 minutes until heated through. Spinach should be wilted but still bright green. Stir in bacon pieces and serve.